The Mozilla Thunderbird to Office 365 Migrator is a reliable application developed with a high-tech algorithm. It has the ability to import multiple Mozilla Thunderbird files to Office 365 user account in bulk in just a few number of clicks. In addition, the software maintains integrity data even after migrating Thunderbird Emails to Office 365. Apart from all this, the software does not any extra installation to run the application on the local machine. Allows to migrate multiple Mozilla Thunderbird files to Office 365 Account at once. Capable to convert corrupted or deleted Mozilla Thunderbird emails to Office 365 account. Option to migrate selective emails from Mozilla Thunderbird file to O365 using a date-based filter. Provides users an option to import Mozilla Thunderbird Mozilla file with or without Impersonation. Import Thunderbird Emails to Office 365 Tool provides an option to retains folder hierarchy during the entire process of migration. Capable to import even SBD file of Mozilla Thunderbird to Office 365 user account. 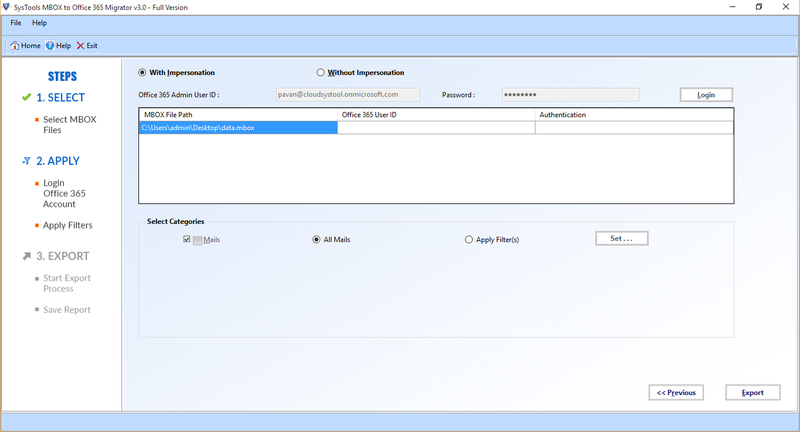 Requires Office 365 mailbox valid credentials to perform conversion successfully. 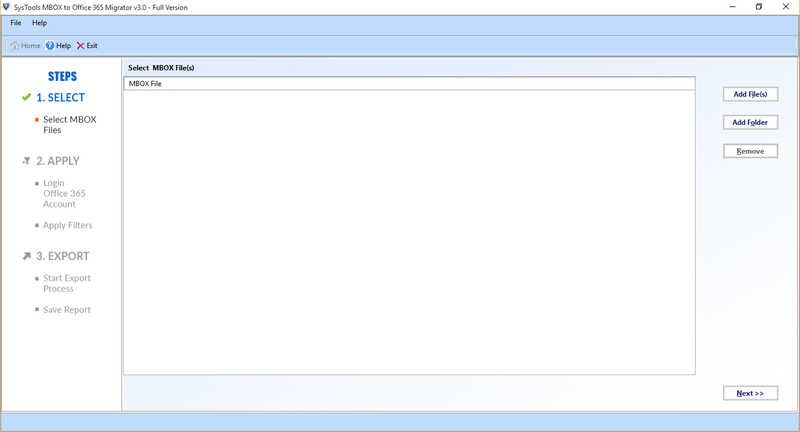 Allows to save the complete export report of Thunderbird Emails to Office 365 in CSV format. The tool can easily be accessed in any version of Microsoft Windows without any hassle. Mozilla Thunderbird to O365 Migrator demo version export 25 Items/folder. 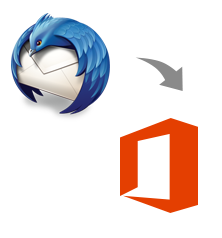 Mozilla Thunderbird application uses Mozilla Thunderbird file format to store the collection of emails. All these emails are stored as a continuous string, which starts with the "From" of an email. But, there can be various possible reasons due to which Mozilla Thunderbird file becomes corrupted or inaccessible. One such causes of corruption are when it exceeds the imposed file size limit. However, all emails of Mozilla Thunderbird are saved in a common Mozilla Thunderbird file. Therefore, it might happen that the size of Mozilla Thunderbird file exceeds its predefined limit, which leads to corruption and makes it inaccessible. There can be various possible reasons behind Mozilla Thunderbird to Microsoft Office 365 migration. Thunderbird is a desktop-based and can be accessed on the desktop only. On the other side, Office 365 is a cloud-based application and accessed anywhere a user wants like in smartphones. In addition, Microsoft Office 365 provides more professional environment as compared to Mozilla Thunderbird. Apart from all this, Mozilla Thunderbird files are very much prone to corruption. Therefore, a user can use this best Mozilla Thunderbird to MS Office 365 Migrator to perform the migration in an efficient manner. In order to move multiple Mozilla Thunderbird files of Mozilla Thunderbird to O365 at once, one can simply use this application. It is one of the best solutions to move Mozilla Thunderbird file from any application to Office 365 account without any issue. Moreover, due to its simple, easy, and self-explanatory user interface, it becomes very much popular across the worldwide. Does the software require Mozilla Thunderbird application installation to import MBOX file to Office 365 account? No, this import MBOX to Office 365 software does not require Mozilla Thunderbird application installation to perform migration successful. Is there any MBOX file size limitation imposed by this MBOX to Office 365 Migrator tool? No, the application does not have any file size limitation. 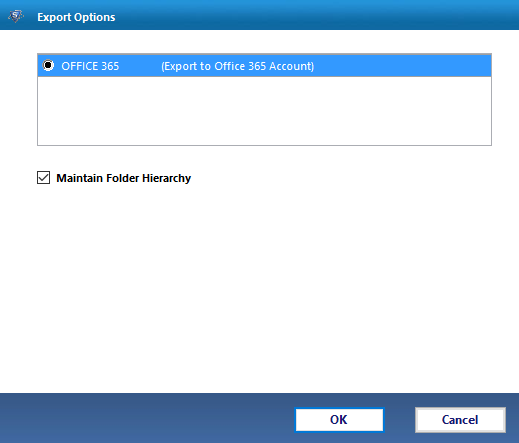 A user can import any size MBOX file to Office 365 account without any hassle. Can I migrate multiple Thunderbird files to O365 account at once using this application? Yes, you can easily migrate unlimited number of Thunderbird files to Office 365 account in bulk with the help of this software. Can I convert corrupted Thunderbird file to Office 365 account with the help of this software? Yes, you can migrate both corrupted or even deleted Thunderbird file to Office 365 account with the help of this Thunderbird to Microsoft Office 365 migrator. I was looking for the utility that can help in importing Mozilla Thunderbird file to Office 365 account. After sometimes, I came to know about this Thunderbird to MS Office 365 Importer. It is a tool with all required feature and easy user interface to migrate Mozilla Thunderbird to O365 account. Thanks to the developer for such a great development. According to me, it is an impeccable software that I have tried in my entire career. All features of this application are really amazing. It makes my task so easy that I did not find any difficulty while using this tool. Moreover, I like this application so much that I am definitely going to suggest this tool to my colleagues also.